Ackermann’s Repository of Arts, April 1811. 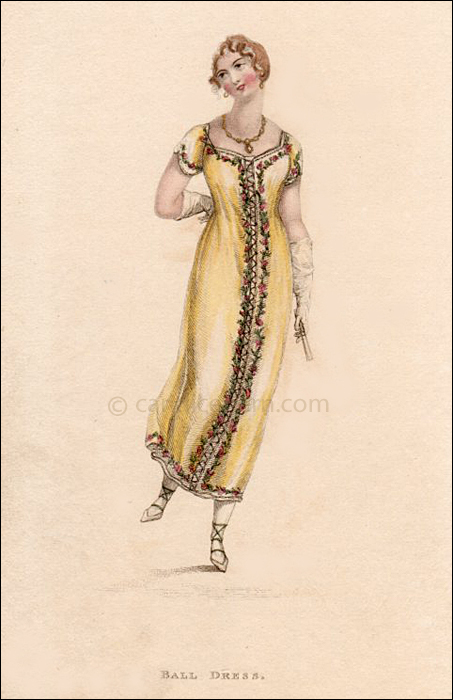 Most dresses described as “Ball Dress” are typically shorter at the hem than other evening dresses. One has to assume that was to make it easier to dance, without tripping over one’s skirt. 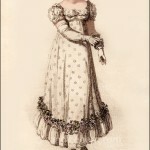 This dress is shown in an especially short length for the period. I suspect it was simply to show off the elegant dancing slippers. Note that they are called sandals. At this time, the term sandal simply referred to any shoe that laced up and over the ankle. They did not wear the open-toed shoes we now associate with the term sandal. 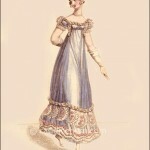 Another interesting element of this dress is the absence of a defined waistline, which is quite unusual for this period.